A lipstick can change one’s entire look. Similar to shoes, your choice of lippie can dictate the look you are going for. Since one can never have enough shoes, one can never enough lipsticks! Am I right, girls? 😉 And where’s the best place to discover the many possibilities of lipstick to start building your collection? It has to be SM Beauty. Whatever your mood is or no matter what day or occasion, they have the perfect shade for you. Whether it be nudes and pinks for chill weekends and classic looks, red and purple for days that you need to own the room and make a statement, or wild colours such as blue and black for days when you are feeling a bit rebellious and bold — SM Beauty has got all your lipstick needs covered. Here’s my cute lipstick bag I got from the preview of #SMLipstickFest that happened last July 29 just in time to celebrate International Lipstick Day! I got so many new shades to add to my growing lippie collection! You too can join and enjoy tons of discounts, freebies, and promotional offers from your favorite make up brands such as Guerlain, Elizabeth Arden, Shiseido, Max Factor, The Bod Shop, Happy Skin, Sleek, L’Oreal, Maybelline, Revlon, Covergirl, Flormar, Essence, Fashion 21, Features and Shades, LA Girl, NYX, Elf, Ever Bilena, Nichido, etc up until September 28, 2016! 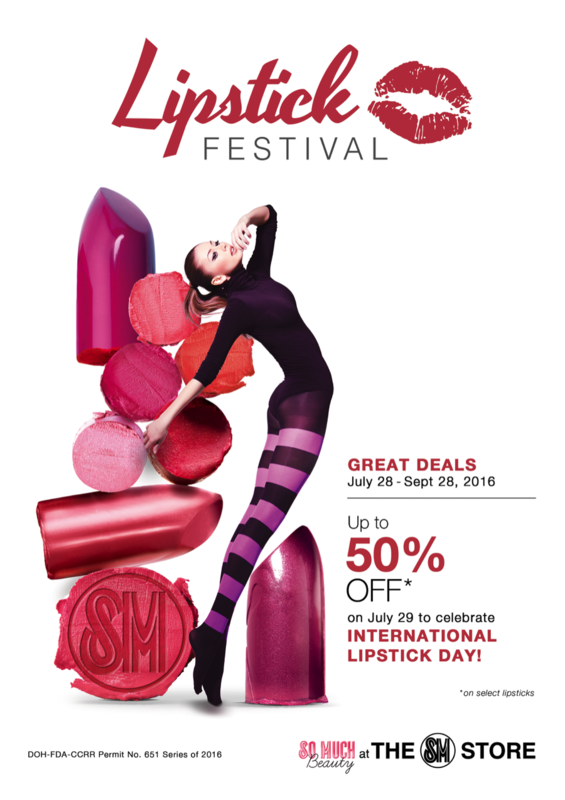 Aside from crazy discounts, SM Beauty offers FREE makeover and lip art service this month. If you’re still on the hunt for new shades to try out, they have resident expert beauty associates who can readily assist and advise you using the products in the store. So whether you’re new to the lipstick world or already an avid collector, SM will help you build and complete your lipstick arsenal. Dive into all the beauty SM has to offer and join the festivities as SM celebrates its 2nd annual SM Lipstick Fest. Follow SM Beauty on Facebook and Instagram for more updates and don’t forget to share your experiences using the hashtag #SMLipstickFest and be part of this global celebration!